Besides having unhealthy obsessions over skincare and cosmetics, I also have crazy over handbags. It is much easier to control my lust over handbags though.... It is expensive to the point that I can hardly afford any. Back then when I was a student, I can easily have any of the bags. But now, a big chunk of my pay taken up by bills, loans and rent. This is not really a big love of mine. But it is certainly a very practical one (yes... I'm a very practical person). It is so easy to pack your stuff for work, weekend or anything! It is spacious and the shape can fit anything... laptop, napkin and baby bottles, magazines, etc. If I ever have this, it is going to be my everyday bag that I can't live without. This has been on my list forever. The price is about RM8k+ in Malaysia which also translate to I-don't-think-I-can-ever-afford-it price. Maybe one day I'll really eat bread for a year and save up just for it. It is a classic, what can I say? I love quilt bags and I love stud too. This is just a perfect combination! And clutch is so convenient for a short trip out of the house for lunch or shopping. This can be quite easy to own since it is not extravagantly expensive. The red color just makes me drool. It looks so stunning!!! I'm sure it will catch any eyes that pass by. This is the latest Speedy by LV. I'm not really a fan of monogram but the impressed monogram is really cool. Speedy is really a great bag. It is convenient to use, spacious, timeless and not to mention........... Asian. Yeah! Back in my uni days, every Asian girl owns a Speedy (except my gang, 'cos we're too cool to follow suit). #5 - Do I need to intro this? Ahhhhh.... Now we come to this. Birkin. Who doesn't want a Birkin. This is not just a bag. It is a symbol of success. If someone ever interview me with the question "What do you think defines a successful woman?". My answer will be "A successful woman is someone who owns a Birkin". And my gay friend made it to the "successful woman" list before I do *roll eyes*. I don't know if I can ever afford this. I'm hoping my mom will hand down hers to me. I used to think that Birkin will one day be mine because I'm the only daughter, but now I have a potential competitor, which is my sister in law. This is also been on my list since forever. I used to own an inspired version from Sportsgirl. God knows where it is now. I really love the bag so I'm considering getting the original one. Note to self: Drop by KLCC Balenciaga to check out the bag when I get back. Overall, the bags that I really really really want is the Hermes Birkin and Balenciaga Motorcycle. They're those that will make my life complete. It's like.... I can die in peace if I have them. The others are my favorite, but not those that I will die for. My love for the Birkin and Motorcycle is like the love of a man towards his legitimate wife, others are just mistress. You know what I mean? 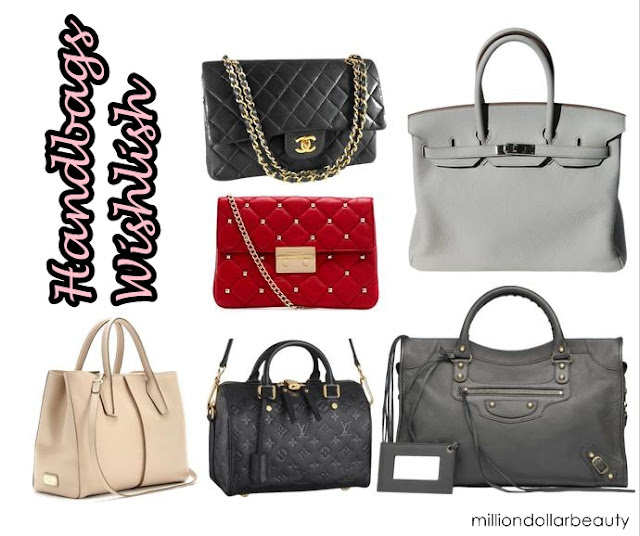 Anyway, do you have any bags that you're eyeing on? Givenchy's antigona and rottweiler cluch or prada's bag nice! Celine's bag also nice but recently too much people take it.